The Russian Progress spacecraft launched without incident last night, carrying three tons of food, fuel, and supplies to the International Space Station. Less than a day after the unexpected Antares rocket explosion, it's reassuring to have a successful cargo run. The Progress 57 capsule launched on a Russian Soyuz rocket out of Baikonur Cosmodrome, Kazakhstan on October 29, 2014, carrying cargo and crew supplies to the International Space Station. 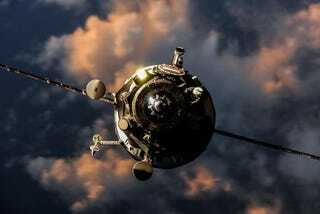 The capsule will remained docked to the station for approximately six months. While the astronauts have enough supplies to last them until spring even if all subsequent cargo runs had been disrupted, it feels good to have a clean, predictable launch after the Antares disaster.